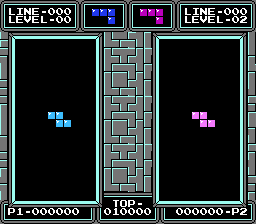 This is a 2 player hack for the NES version of Tetris. In order to accomplish this, the ROM was converted from MMC1 to MMC3. The PRG was expanded to have 2 additional PRG banks. Created custom controls for 2nd player on non & in-game screens. 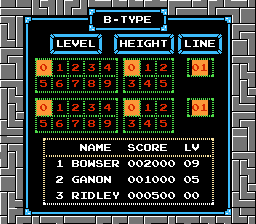 Created custom designs for A/B-Type 2 player mode. Created asm to allow 2nd player to have stats shown on in-game screen. Player 2 has the ability to write their name into the scoreboard. Added a new gameplay feature to the B-Type Mode. 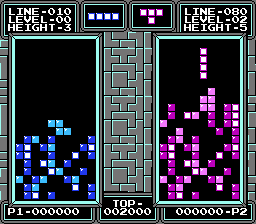 In B-Type mode, in order to win 25 lines must be cleared. There is now the ability to choose how many lines to clear. There is a choice from 01-80 lines to clear. Player 2 now has the ability to obtain their own game piece, no longer sharing/stealing from player 1. Player 2 now has a proper NEXT piece box, along with working select button to enable/disable display. 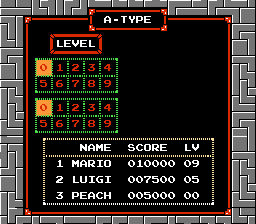 Player 2 now has the ability to select an additional +10 levels from what they choose from A/B-Type (player 1 can hold the A button down when they have level 0-9 highlighted, and when they press start with A button held, the player will start +10 levels from what was selected. Player 2 can also do the same thing. However, this can only be done while player 2 holds down the B button. When player 1 presses start, player 2 needs to have the B button held down in order to get the +10 level). The archive also includes a .sav file for those who own a powerpak for the NES. This is a great hack, I love being able to do multiplayer. There’s just a slight problem, which I don’t know if it’s possible to fix. It seems to be incompatible with the GBMusicA patch. It overrides it, regardless of what order the game is patched. 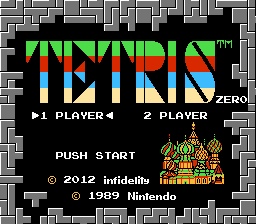 The hack itself isn’t bad, it just would be better if we could also listen to the most iconic Tetris music as well.